Local surfers probably already know the WRV x Pacifico 2017 Outer Banks Pro is right around the corner! But for those planning a visit to the Outer Banks why not join us for the 2017 Wave Riding Vehicles Outer Banks Pro presented by Pacifico! Surfing events as big as this one don’t come along all that often! The WSL Men’s Qualifier Surf Event will take place on August 30 – September 3 (Labor Day Weekend) at Jennette’s Pier in Nags Head, NC. Even if you’re not participating, plan on coming out to watch. It’s an exciting event not to be missed! Wave Riding Vehicles stands for surfing and has been spreading the Aloha throughout the world since 1967. Today WRV continues to support surfing in all its traditional and competitive forms and just celebrated their 50th anniversary. The Wave Riding Vehicles Outer Banks Pro established its home here in 2009 with the completion of the new Jennette’s Pier in Nags Head. The pier’s stellar views and its ample parking both added to what has become the most core surf contest on the east coast. Its eco-conscious design supports ocean ecosystem conservation and awareness. 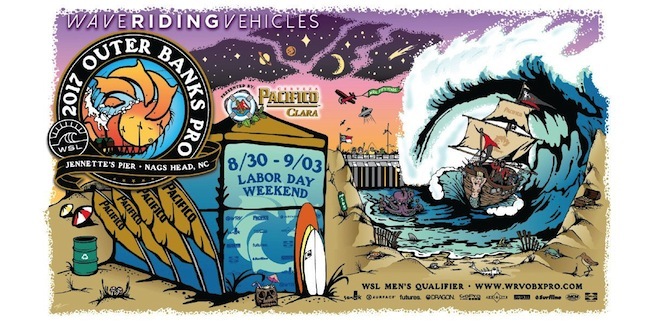 Typically held the last weekend in August, the WRV Outer Banks Pro is an official WSL QS1000 event drawing top rated surfers from around the globe to the unique coastline of Outer Banks of North Carolina. It’s expected to be a great contest with a smoking swell. We hope to see you on the water!